The tragic collapse of the Plasco Building in Tehran raises concerns whether the Iranian capital should be relocated from its seismically dangerous region. Despite the fact that the iconic Plasco Building was constructed in 1962 by leading Iranian engineers, a major fire that broke out in the high-rise on January 19 didn't just ravaged the structure; it caused it to collapse. 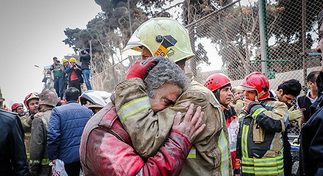 The fact that a fire could cause so much destruction prompted the Iranian public to wonder what might happen to other buildings in Tehran in the event of a major earthquake. Bahram Akkasheh, a prominent geophysicist who is known as 'the father of Iranian seismology', told Sputnik Persian that the authorities should urgently consider either relocating the capital to a less-dangerous area or at least improve the earthquake resistance of buildings in Tehran. "Virtually all of Iran’s territory is a seismically active area. About 83 percent of our cities are located in seismically dangerous areas, with another 16 percent in somewhat safer territory. Only 1 percent of our settlements, about a thousand small towns and villages where the probability of an earthquake is the smallest, can be considered safe," Akkasheh said. He further explained that 20 years ago, Iran’s Supreme National Security Council tasked him to analyze seismic loading and provide substantial evidence confirming that Tehran is a seismically dangerous zone – a task that Akkasheh successfully completed. "I offered three types of anti-seismic measures. My first and main proposal was to ensure that all buildings have earthquake-resistant structures. The second proposal was to establish a crisis headquarters to coordinate relief efforts in the aftermath of devastating earthquakes; and the third proposal was to relocate the capital," the geophysicist said. He also added that while the crisis headquarters was indeed created, the issue of capital’s relocation, while initially approved by then-President Mahmoud Ahmadinejad, was eventually put on hold and apparently abandoned. But unless proper precautions are taken, a powerful earthquake may wreak untold destruction in Tehran, a city with a population of 15 million and a considerable seismic load. "The capital’s relocation would be an arduous and lengthy process that may take up to several years to complete. On the other hand, if we use funds that could theoretically be allocated for this task to instead improve the earthquake resistance of the existing buildings, that would be a prudent move. Previously the capital of Iran was located in Tabriz (for 50 years), Qazvin (for 40 years), Shiraz (for 16 years) and Isfahan (for 138 years). As for Tehran, choosing this city to be our capital was a big mistake in my opinion. Alas, our people don’t take into account the fact that the main cause of earthquakes is located below Earth’s crust, not above it," he said.